I very well know who Fugazi is and where they come from, but I Can't help but think that the songs Ian sing on (especially Styrofoam) that this is what D.Boon's music would sound like if he were alive today. The First Fugazi i have ever heard back in the days. Since, i've became SxE and I bought all of their albums. This one is one of my favorite album of all time ! I found this at my local record store when I was 12 years old, on cassette. 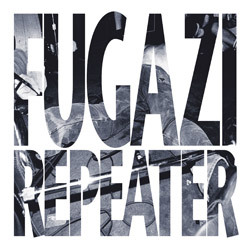 I had no idea who Fugazi were at the time, but I was drawn to this album. And this album changed everything for me. It shattered my conception of what music could do and be. Probably the most important album of my life. This is Fugazi's first full-length record, released in 1990. CD includes 3 songs from the #043 7 Inch. This album (minus the songs from the seven Inch) is also available on a re-mastered 12" LP.